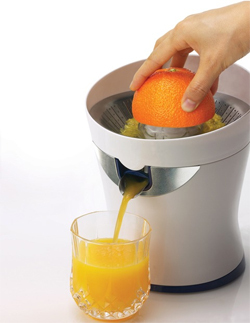 There are several different types of juicers that handle different functions. Centrifugal juicers are the most common and range from $50 to $200. Masticating juicers are quieter, heavier, and more expensive, typically running up to $350. Some of the most expensive juice extractors take wheatgrass and may or may not process fruits and vegetables; these juicers can cost up to $800. There are high-quality models of any juicer variety. You simply need to know how you plan to use your juicer before you make a purchase decision. See the juicer comparison and ratings below with a link to the full review of each. You’ve heard of the wonders of juicing and thought you’d give it a try. Who doesn’t like wholesome fruit and vegetable juice or healthy wheatgrass concoctions? As you begin your juicer search, though, you may be initially confused by all the different types of juice extractors and the different functions they provide. With proper research, you’ll better be able to select the juicer that fulfills your expectations and juicing needs. How much can you budget for a juicer? 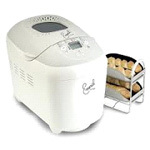 If price is an issue, then consider some of the inexpensive but general purpose centrifugal juicers. 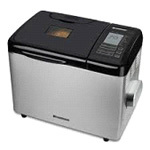 These models can handle most fruits and vegetables, are easy to clean, and have fast juicing power. 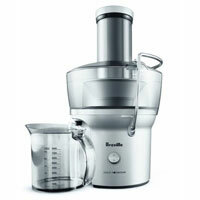 A good centrifugal juicer can run between $50 and $200. If you have more cash to spend and want an even higher-quality machine, then consider a masticating juicer. These large and heavy machines are very quiet, produce little heat, and preserve the natural enzymes and nutrients of fruits and vegetables, making for a healthier drink. They yield more juice, too. You can expect to pay up to $350 for a good masticating juicer. Are you interested primarily in juicing basic fruits and vegetables? Centrifugal and masticating juicers serve that purpose quite well. Or are you more interested in leafy greens and wheatgrass? These kinds of food are high in fiber, which is difficult or impossible for regular juicers to handle. There are juicers made exclusively for wheatgrass, the most expensive variety. Some juicers are even more versatile, capable of extruding pasta; grinding and processing food; and making ice cream, baby food, and salsa. You just have to decide how much you’re willing to pay for such special features. The most effective juicers waste very little food. They squeeze out the maximum amount of juice and nutrients and leave the driest pulp. Centrifugal juicers are quite effective at this process, and masticating ones yield even more juice and less foam. Always find out how wide the feed chute is on a juicer. The larger the tube, the easier it is to feed whole fruits and veggies into the machine without having to chop them up first. Also find out how well the filter works and how much the pulp collector holds. If you have to frequently stop juicing foods to clean pulp off the filter or empty out the pulp bin, it will slow down the whole process. For a centrifugal juicer, a powerful motor is a good thing. It speeds up the juicing process and yields more juice output. However, a high-speed motor also creates more foam in the juice and burns away the enzymes in fruits in vegetables. Masticating juicers use a slower-speed motor, which runs quieter, delivers cleaner juice, and produces little heat. Dishwasher-safe juicer parts will save you a lot of time keeping the machine clean and in working order. Sometimes the filter screen requires some hand brushing to get all the pulp residue off. Look for juicer models that are easy to put together and take apart. The housing material also affects how easy it is to keep clean. Stainless steel is not only more durable and polished, it’s simple to wipe down with a cloth. Models with plastic housing can become stained over time, especially with foods like carrots and beets. Read customer reviews to get an idea of how well a juicer runs, and look at different models in the store to get a feel for the design, size, and construction. Based on your needs and expectations, you should be able to find a juicer that has all the features and functions that will make it worth the price.